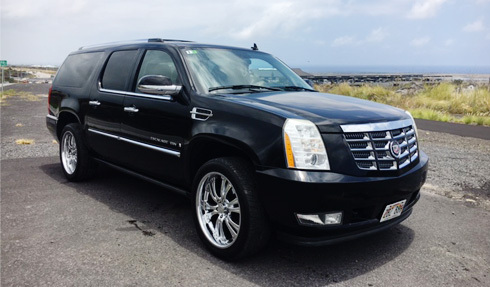 When traveling the Kohala Coast, look to Resorts Limousines for all of your Hawaii limo transportation needs. We provide limousine service for all of the Big Island of Hawaii. With an expansive fleet of minivans and sedans, reserve a limo, sedan, or shuttle van today! Enjoy First class luxury transportation, Resorts Limousines specializes in Hawaii Limo tours, airport transfers, Hawaii Wedding Limos, limousine service and ground transportation to resorts, group transportation, and shuttles. Servicing the Kohala Coast as well as the entire Island of Hawaii. Reserve one of our late model stretch limousines, sedans, SUV's, 12 Passenger Mercedes sprinters. Whether you're just riding from the airport to your resort or taking a scenic limousine tour to see the Hawaii sights, make Resorts Limousines your choice for luxury transportation.